During its second week, the latest in the Super Sentai VS series drops to 4th. Dropping just one spot on the charts from its first week, Zyuden Sentai Kyoryuger vs Tokumei Sentai Go-Busters: The Great Dinosaur Battle! Farewell, Eternal Friends came in 4th on the charts according to Eiga.com and 6th according to Box Office Mojo’s international charts. The movie brought in $805,326 over the weekend, bringing its total to $2,417,935. With 305 screens, this marks the widest release for a Super Sentai VS feature to date. 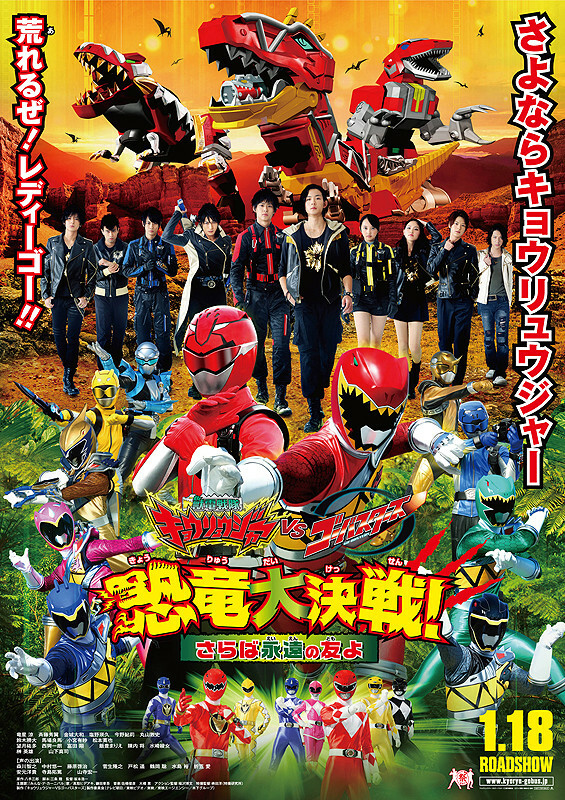 The latest in the long line of Sentai team up movies, Kyoryuger VS Go-Busters also sees the return of two other dinosaur-themed teams: Abaranger and Zyuranger. The movie also gives viewers an early look at the new Ressha Sentai ToQger team, bringing the total to five teams featured in a single movie.